It’s alleged that All in the Family was the first series to break ground (or is that wind) and actually flush a toilet during prime time. Since then, potty humor has become a staple of book, movie and TV giggles. 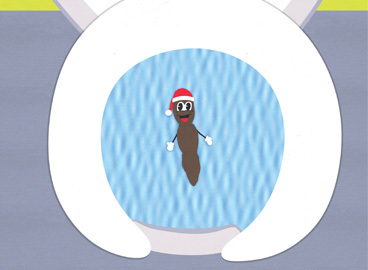 Here are 10 of our most memorable poop-culture moments. We’ve even given them “stinky and offensive” ratings to give you fair warning before watching the link. Our #10 was so bad, we couldn’t even link to it. That’s what Google is for people. Did we miss some of your stinky faves? Share them in the comments below! A hilarious tale of the turd that just won’t flush — everyone’s worst nightmare. “The tank refilled, and I made a silent promise. The deal was that if this thing would go away, I’d repay the world by performing some unexpected act of kindness. I flushed the toilet, and the beast spun a lazy circle. “Go on,” I whispered. “Scoot! Shoo!” I claimed a giddy victory, but when I looked back down, there it was, bobbing to the surface in a fresh pool of water…” Originally published in Esquire and part of his collection of essays in Me Talk Pretty One Day, (Little, Brown and Company, 2000). Here it is in it’s chunky glory. A Baby Ruth bar is casually flung in the pool creating mass hysteria. (“Spalding no!” “Doody!”) Of course, Bill Murray has the last laugh. Food poisoning and taffeta do not mix. The film — and maybe the scene —put Melissa McCarthy on the map, and reminded audiences that so-called “chick flicks” can be just as toilet-minded as any. Just the phrase “was it the grey lamb or weird chicken?” or “Jordan almonds,” for that matter, can make us gag. Director John Waters’ low budget schlock-shocker shows drag queen — a.k.a. “Filthiest Person Alive” — actually eating dog doo. Has there ever been a rival to this vile moment? We don’t think so. Ok. Is it wrong that I find all this poop talk amusing? By far my favorite. Even over my OWN article 🙂 Pop culture and poop — what’s not to love? Brilliant, hilarious and breathtaking (literally, for me) compendium of sharking moments. Thanks for the freeing laughter! Living in and near philly, this subject is way obviously stinky…. walking quickly home from work to go down a ginko berry strewn street on a beautiful crisp autumn day and then, phew….stinko. And the added ‘phlarts’ (which is what they call an arts program here) and we then drive past the biggest clothes pin – definitely a giggle to cry laughing subjects, which of course released a toot. I know it’s not exactly the same, but I will always, always, crack up when I think of the chili scene from Blazing Saddles. Classic. The latrine swim in Slumdog Millionaire.